Aidan Connolly looks into a trio of government-issued design projects, and at the messages being sent and received. We don’t tend to think of bureaucrats as being particularly concerned about design. For most people, having something ‘designed’ is synonymous with it being beautiful or exclusive — a luxury far beyond the scope of public policy. Many of us live in societies where design has become an unpopular policy decision — an unnecessary expenditure in a fragile financial climate. However, this is to miss both the functional point of design, and the rhetorical aspects. On the functional side, a well-designed system can maximise efficiency by streamlining processes and reducing the waste of time and resources. From a rhetorical angle, well-considered design of official items can be used both as a point of pride for citizenry, and also as a tool to shape national discourse on identity and values. Recently, a handful of nations in northern Europe have been making plenty of hay with government-officiated design. 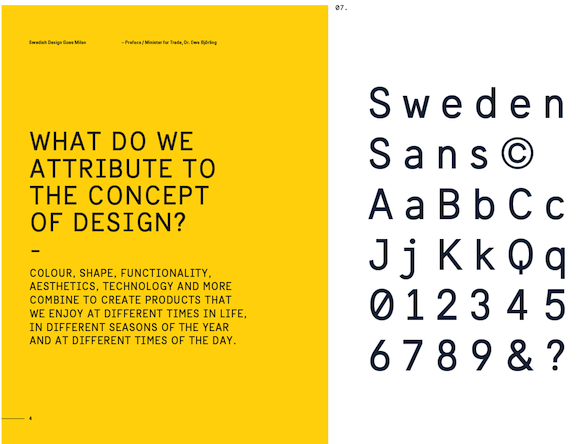 Take Sweden Sans, the official typeface of Sweden that launched in 2013. Designed by Stockholm-based studio Söderhavet, Sweden Sans exists in a fairly small lineage of typefaces effectively synonymous with certain nations — think Helvetica, Gill Sans, and the unfortunate Fraktur. What separates Sweden Sans from its predecessors however, is its state-ordained origins. It is the largest attempt to create a national typographic style functioning across a large variety of government bodies. Sweden Sans used in a brochure urging an international audience to ‘Study in Sweden’. Image from Söderhavet. Sweden Sans used in a brochure for ‘Swedish Design Goes Milan’. About the formal qualities of the typeface itself: it is a pleasant, well-executed, typed slab serif, proportioned as a Grotesk. It calls to mind Akkurat Mono, despite the fact that Sweden Sans is somewhat narrower and has variable widths, and some particular Swedish quirks. The particularity of the quirks is Sweden Sans’ raison d’être, however. It exists as an attempt to define the voice of about 9.5 million, and has to grasp at whatever common threads it can. I do not mean this dismissively — it is a gargantuan task, and as a rhetorical tool Sweden Sans has been well served by ambiguities. The feedback given almost reads like a long joke about Swedish people with no punchline: minimalist, robotic, stylish, cold, modern, retro, IKEA-esque, “not very exciting”. After a certain point, it becomes a Rorschach test, where its association with the nation overpowers the actual qualities of the type. When imagery comes into play, however, we start to see clearer messages. 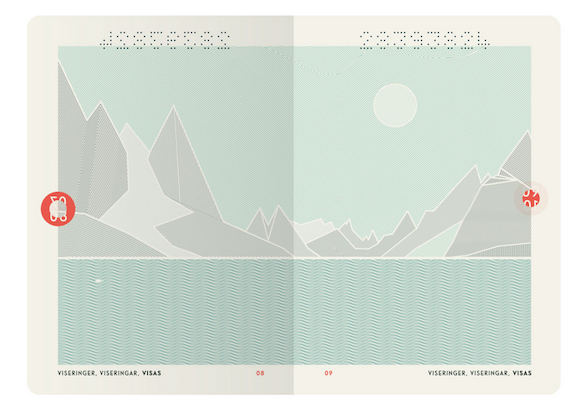 Norway caused a stir last year with the announced redesigns of its passports (from Olso studio Neue) and currency (by architecture firm Snøhetta and design studio Metric System), both of which caught the attention of quite a few design blogs. Across both these projects there is a quite literal identitarian message: Norwegians are often stereotyped by the other Scandinavian nations as being a little rustic, for one, and this has manifested itself with a positive spin in the briefs. 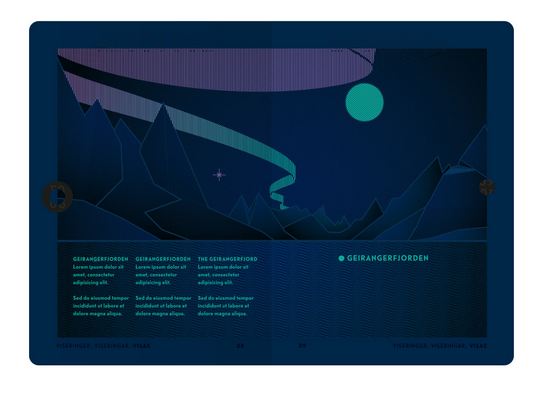 The brief for the kroner redesign requested an oceanic theme, while the passports feature Norway’s distinctive frozen fjords and the aurora borealis as a security feature. The imagery of landscapes and natural wonders goes hand-in-hand with the less overt point of these redesigns, which nods to the levels of public wealth and luxury permitted by Norwegian natural resources. Particularly with regards to the passports — they are beautiful. 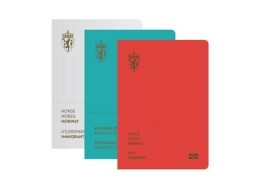 And of course, available to all Norwegian citizens. This begins a series of conflations, between natural resources, private luxury and public ownership. 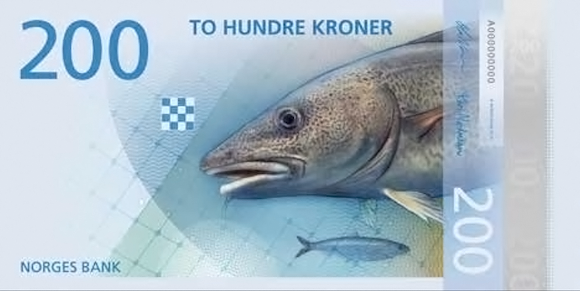 The passports suggest that Norwegians are all partial owners of their economy (not untrue, given the low levels of wage inequality), as well as stakeholders in the natural goods the land provides. In many ways, these design artefacts are some of the clearest manifestations of Scandinavian socialist policy, and have proved a useful tool in not only communicating these policy values to its citizenry, but abroad as well. Across the Baltic, the message is being received loud and clear. Estonia isn’t often classified as Nordic, but its political climate has been pushing for inclusion in the category since its independence from the USSR in 1991. Like many formerly Soviet nations, its liberation gave political impetus to seek closer ties to the West, and in Estonia’s case, particularly with its Scandinavian neighbours and Finland. 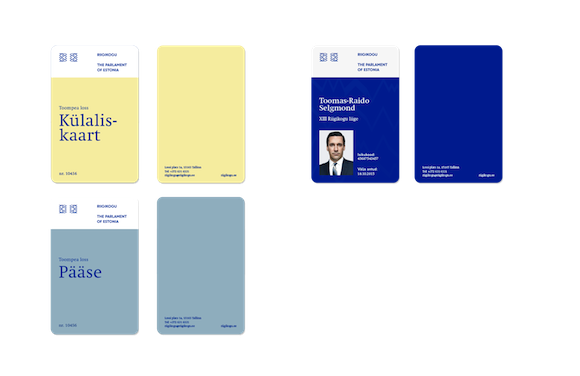 Now over twenty years later, and you start to see projects like the Riigikogu identity, from Tallinn-based studio Aku. At first blush, this Parliament House identity seems a bit conservative and quite in line with similar identities for the Danish and Norwegian parliament. The type is sensible, and in good taste; the colour scheme is unlikely to ruffle any feathers. Scrolling down its project page, it seems like a well done identity, if somewhat limited by bureaucracy. Then, halfway through, things get a bit weird. Aku’s Riigikogu identity starts to break down a zig-zag element to be ‘used for creating decorative patterns.’ These stem from the architectural details of the world’s ‘only expressionist parliament building,’ but also read as sound waves, or as static. 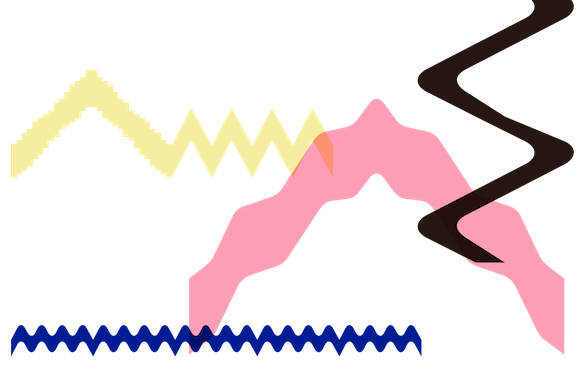 The visualisations of the zig-zags take up almost half the images presented for the project. 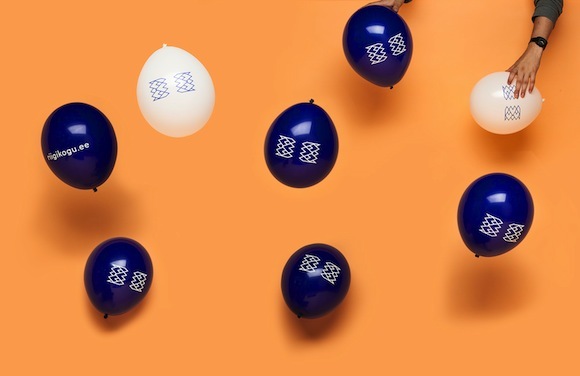 There’s other quirky details, too — balloons with the logo on them, Jon Hamm on the ID cards. Touches of joy that don’t quite fit the typical Scandinavian mold, but seem a world away from either the Saeima in Latvia or the Duma in Russia. Clearly, Aku has more in mind when it comes to describing how their nation’s elected voice should feel. While only the basic logo seems to presently be in use for the Riigikogu, the cleanness of much of the identity does establish clear links to Scandinavian modernism, and the fact that the less conventional parts were entertained at all reflects a country that has spent a lot effort promoting its own innovations and its drive to measure up as a model European nation. Do I detect Don Draper in this design?